NEW YORK – April 12, 2019 – The NFL and NFL Players Association today released the results of their annual laboratory study to assess the performance of helmets worn by NFL players. The results of the tests are displayed on this poster and shared with NFL players in addition to club medical, training, coaching and equipment staffs to help inform equipment choices. The tests, designed jointly by NFL and NFLPA-appointed biomechanical engineers, simulate a subset of concussion-causing impacts sustained by NFL players during games to determine which helmets best reduced head impact severity in those conditions.The study continues to measure rotational velocity and acceleration as part of a combined metric to evaluate helmets. On the 2019 poster, the top-performing helmets in the laboratory testing are shown in a gradient of green, with darker green helmets performing better than lighter green helmets, and helmets in yellow performing worse than the green helmets. 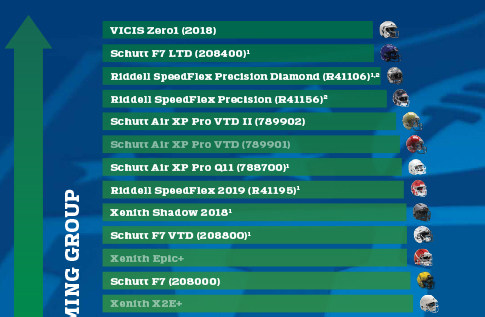 None of the 11 helmets tested this year were added to the list of prohibited helmets; however those on the prohibited list* in 2018 remain as such and no player will be grandfathered into being able to wear a prohibited helmet this season. The experimental design and data analysis were performed by NFL-appointed consultants including Dr. Jeff Crandall, Professor of Engineering and Applied Science and Director of the Center for Applied Biomechanics at the University of Virginia; Dr. Ann Good, Senior Mechanical Engineer for Biocore; and Dr. James Funk, Principal Engineering Consultant and Co-Founder of Biocore. The analysis was done in conjunction with two NFLPA-appointed consultants, Dr. Barry Myers, Professor of Biomedical Engineering at Duke University, and Dr. Kristy Arbogast, Co-Scientific Director and Director of Engineering for the Center for Injury Research and Prevention and Chair of Pediatrics at Children’s Hospital of Philadelphia. An independent biostatistician, Dr. Timothy McMurry, Assistant Professor of Biomechanics at the University of Virginia’s Department of Public Health Sciences, was retained to help with analysis of the data.